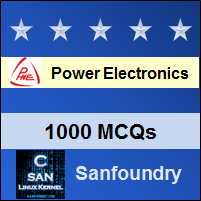 This set of Power Electronics Multiple Choice Questions & Answers (MCQs) focuses on “Diode Circuits-3”. 1. 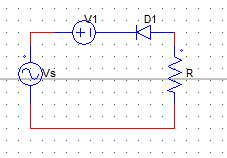 For the circuit shown in the figure below, consider the diode as an ideal diode & rms value of source voltage as Vs. Explanation: The diode short circuits the load in the negative half cycle. The peak value in the positive half is 1.414 x Vs. 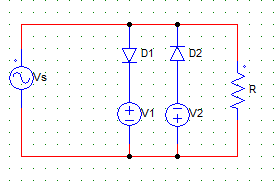 Explanation: Diode is reversed biased in the positive half cycle. In the negative half cycle, apply KVL to get the value of peak voltage at the load. The peak value of voltage at R in the positive and the negative half cycles are ___ & ___ respectively. Explanation: Load is S.C in the positive half cycle hence, voltage is zero. In negative half the peak value is (230 x 1.414) – 2(drop across the diode) = 323 Volts. 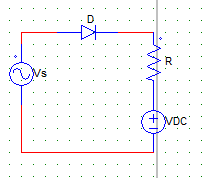 Explanation: Diode is reversed biased in the negative half cycle. In the positive half cycle, apply KVL to get the value of peak voltage at the load. Peak value = Vm + V1, as V1 is aiding the positive anode of the diode. Explanation: In the positive half, only D1 is active. Hence use KVL, Vo = 8 + 0.7 Volts. Explanation: In the negative half, only D2 is active. Hence use KVL, Vo = 6 + 0.7 Volts. 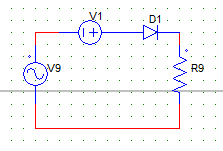 Explanation: During the negative half diode is not conducting hence Vr (voltage across the resistor) = 0. Vo = Vdc. Explanation: The diode is forward biased for half cycle (180 degrees) and reversed biased in the another 180 degrees. Hence, per cycle it only conducts for 180 degrees or π radians. Explanation: For an R – L load, the inductively load can make the diode to force conducted hence, the conduction time can be greater than 180 degrees. Explanation: As the cut-in voltage for D1 is lesser than D2, D1 would start conducting first & S.C D2. Hence, only D1 conducts with I = 50/5000 A.